I want them to be lower. Overall, we burn 20% of our front-end CPU on garbage collection, which seems high. Each process handles ~29,000 requests before getting killed by the memory limit, and the GC is triggered about every 30 requests. In memory-managed languages, you pay a performance penalty at object allocation time and also at collection time. Since Ruby lacks a generational GC (although there are patches available), the collection penalty is linear with the number of objects on the heap. In Ruby 1.8, Struct instances use fewer bytes and allocate less objects than Hash and friends. This can be an optimization opportunity in circumstances where the Struct class is reusable. In my understanding, each key in a Hash is a VALUE pointer to another object, while each slot in a Struct is merely a named position. Immediate types (Fixnum, nil, true, false, and Symbol) don’t allocate, except for Symbol. Symbol is interned and keeps its string representations on a special heap that is not garbage-collected. If you have allocation counts from a production web application, I would be delighted to know them. I am especially interested in Python, PHP, and Java. Python should be about the same as Ruby. PHP, though, discards the entire heap per-request in some configurations, so collection can be dramatically cheaper. And I would expect Java to allocate fewer objects and have a more efficient collection cycle. I’ve released Scribe 0.1, a Ruby client for the Scribe remote log server. The primary benefit of Scribe over something like syslog-ng is increased scalability, because of Scribe’s fundamentally distributed architecture. Scribe also does away with the legacy syslog alert levels, and lets you define more application-appropriate categories on the fly instead. Dmytro Shteflyuk has good article about installing the Scribe server itself on OS X. It would be nice if someone would put it in MacPorts, but it may be blocked on the release of Thrift. One of the hardest gems to install is no more. It’s now easy to install! Install with gem install memcached. Since libmemcached is bundled in, there are no longer any dependencies. Andreas Fuchs suggested several months ago that I include libmemcached itself in the gem, but at the time I resisted. I was wrong. My opposition was based on the idea that libmemcached itself would be an integration point, so running multiple versions on a system would be bad. In real life, the hash algorithm became the integration point, not the library itself. And since the library’s ABI kept changing, the gem always required a very specific custom build. This annoyed the public and caused extra work for my operations team, who had to make sure to upgrade both the library and the gem at the same time. Updates can come thick and fast now because I don’t have to worry about publishing custom builds or waiting for the libmemcached developers to merge my patches. In retrospect it seems obvious—it’s always a win to remove coordination from a system. Unfortunately, it was easier to make that decision than it was to implement it. Linux and OS X link libraries differently, and I had a lot of trouble making sure that no system-installed version of libmemcached would get linked, instead of the custom one built during gem install. When you link a shared object, OS X seems to maintain a reference to the original .dylib. Linux does not, and depends on ldconfig and LD_LIBRARY_PRELOAD to find the object at runtime. Since you can’t modify the shell environment from within a running process, there’s no way to override LD_LIBRARY_PRELOAD, so I needed to statically link libmemcached into the gem’s own .so or .bundle. The only way I could do this on both systems was to configure libmemcached with CFLAGS=-fPIC --disable-shared, rename the libemcached. * static object files to libemcached_gem. *, and pass -lmemcached_gem to the linker rather than -lmemcached. Otherwise the linker would prefer the system-installed dynamic objects, even with the correct paths and -static option set. Note that you can check what objects a binary has linked to via otool -F on OS X, and ldd on Linux. Feel free to look at the extconf.rb source and let me know if there’s a better way to do this. Cassandra is a hybrid non-relational database in the same class as Google’s BigTable. It is more featureful than a key/value store like Riak, but supports fewer query types than a document store like MongoDB. April 28, 2011: post updated for Cassandra gem 0.10 and Cassandra version 0.7. 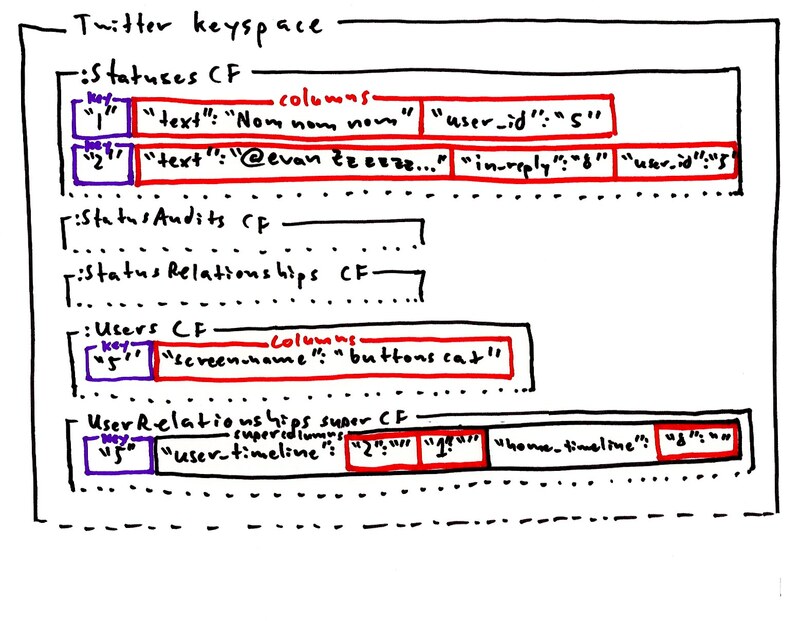 Now your schema is loaded too. The server must be running; as of version 0.7, Cassandra supports updating the schema at runtime. 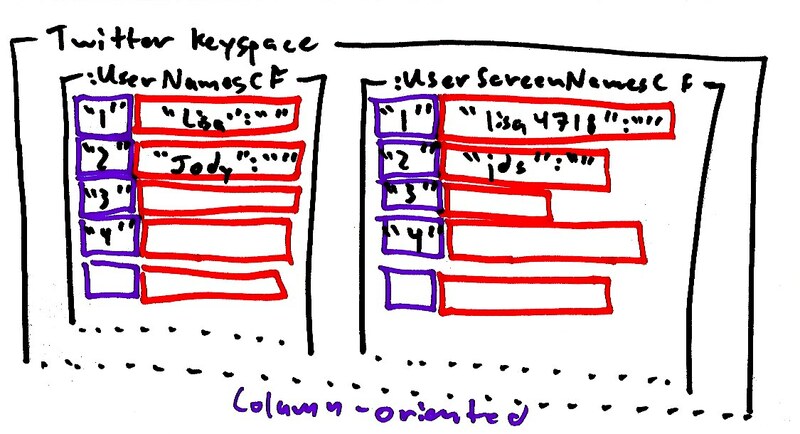 Column families are stored in column-major order, which is why people call BigTable a column-oriented database. This is not the same as a column-oriented OLAP database like Sybase IQ—it depends on whether your data model considers keys to span column families or not. Cassandra is an alpha product and could, theoretically, lose your data. In particular, if you change the schema specified in the storage-conf.xml file, you must follow these instructions carefully, or corruption will occur (this is going to be fixed). Also, the on-disk storage format is subject to change, making upgrading a bit difficult. Hardware: get a handful of commodity Linux servers. 16GB memory is good; Cassandra likes a big filesystem buffer. You don’t need RAID. If you put the commitlog file and the data files on separate physical disks, things will go faster. Don’t use EC2 or friends without being aware that the virtualized I/O can be slow, especially on the small instances. I think that Cassandra is the most promising current implementation of a distributed OLTP database, but much work remains to be done. At this point, there are many better resources around the web than above. Check the official Cassandra website. I’ve been reading a bunch of papers about distributed systems recently, in order to help systematize for myself the thing that we built over the last year. Many of them were originally passed to me by Toby DiPasquale. Here is an annotated list so everyone can benefit. It helps if you have some algorithms literacy, or have built a system at scale, but don’t let that stop you. The Death of Architecture, Julian Browne, 2007. First, a reminder of what it means to build a system that solves a business problem. Browne built the space-based billing system at Virgin Mobile, one of the most well-known SBAs outside the financial and research industries. That lovely diagram showing clean service-oriented interfaces, between unified systems of record, holding clean data, performing well-defined business processes is never going to be….You have to roll up your sleeves, talk to the business analysts, developers, operations and make a contribution that makes those boxes and arrows real. System failures in the web world are most often due to inflated technical requirements and integration risks, not an incorrect decision to skip two-phase commit. The Case for Shared Nothing, Michael Stonebraker, 1985. The source of the shared-nothing paradigm, and importantly, its alternatives. Shared-nothing is a nice hammer, but not every problem is a nail. Harvest, Yield and Scalable Tolerant systems, Eric Brewer, 1999. Distributed Computing Economics, Jim Gray, 2003. How to predict the cost of the thing you want to build. Via some napkin math, Gray shows why making the cloud cost-efficient for current problems continues to be a struggle. Guardians and Actions: Linguistic Support for Robust, Distributed Programs, Barbara Liskov and Robert Scheifler, 1983. Two-phase commit. Making sure what you plan to do will get done. Time, Clocks and the Ordering of Events in a Distributed System, Leslie Lamport, 1978. Distributed systems are inherently relative; there is no privileged position that can describe all events exactly. Lamport clocks (and the closely related vector clocks) let participants agree on the order of events in the world, if you need to care about that. Paxos Made Simple, Leslie Lamport, 2001. The consensus problem: how can potentionally faulty processes agree about an element of global state? The Paxos algorithm guarantees correctness during a failure of a minority of nodes. This paper is difficult, but important for the subtleties it reveals. Also see Paxos Made Live for a discussion of the implementation in Google’s Chubby v2 coordination server. Real life introduces many unfortunate kinks. Generative Communication in Linda, David Gelernter, 1985. Tuple spaces, a.k.a. the blackboard pattern, a.k.a. spaced-based architecture. Coordinating a system through the data, not through the behaviors. I will be writing a lot more about this in the future. Chord: A Scalable Peer-to-peer Lookup Service for Internet Applications, Ion Stoica, et al., 2001. The original distributed hash table paper. Introduced consistent hashing for robust pool rebalancing. Frangipani: A Scalable Distributed File System, Chandramohan A. Thekkath, Timothy Mann and Edward K. Lee, 1998. Classic paper regarding modern-style distributed filesystems. Dynamo: Amazon’s Highly Available Key-Value Store, Giuseppe DeCandia, et al., 2007. A key-value store that spawned numerous clones, it integrated many fundamental ideas from the above works into an actual running system. Cassandra is the most featureful open-source version. SEDA: An Architecture for Well-Conditioned, Scalable Internet Services, Matt Welsh, David Culler, and Eric Brewer, 2001. Great paper on managing the interactions between individual components, and ways to build a well-conditioned service under unpredictable load. That’s all really. Focus on the ideas, not the implementations. Try to see the patterns in existing systems, rather than imagining how they “should” work if everything was perfect. Then you’ll be able to scale to the moon. The moon is above the cloud and therefore obviously more scaleable. Update: five additional papers are here. Memcached is generally treated as a black box. But what if you really need to know what’s in there? Not for runtime purposes, but for optimization and capacity planning? Peep uses ptrace to freeze a running memcached server, dump the internal key metadata, and return the server to a running state. If you have a good host ejection mechanism in your client, such as in the Twitter libmemcached builds, you won’t even have to change the production server pool. The instance is not restarted, and no data is lost. Installation instructions are here. Requires Linux. On read, if a key is past its expiry time, return NOT FOUND. On write, choose an appropriate slab class for the value; if it’s full, replace the oldest-used (read or written) key with the new one. Note that the second strategy, LRU eviction, does not check the expiry time at all. This makes eviction an O(1) operation, because the tail of the LRU linked list is immediately available; checking within that list for evicted keys first would raise the order to O(N). This optimization has subtle implications. In the bad old days, we added a page cache to Twitter via memcached. 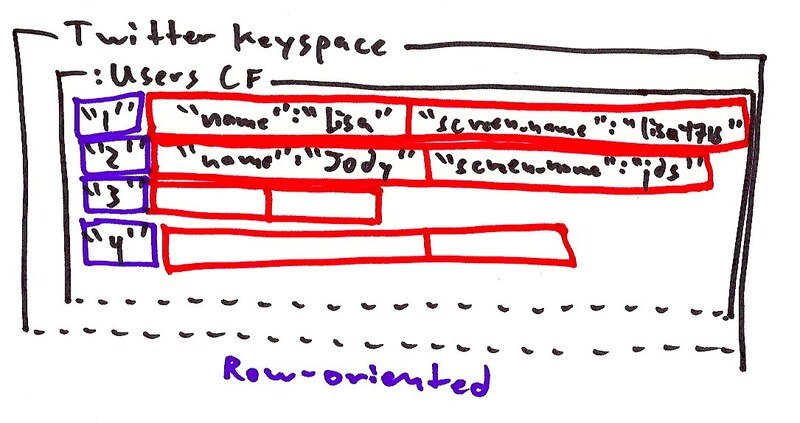 We used a generational key scheme: a piece of user metadata was incremented on every change, and used to construct dependent keys. This eliminated direct invalidation concerns. However, because of the orthogonal expiry and LRU strategies, we knew that the generational keys were affecting our evictions of direct keys. The continual massive onslaught of new generational keys would sweep out older direct keys, even when the generational keys were expired, but the direct keys were fresh. But how could we prove it was happening? Eventually we ran peep on a representative server. Aggregate results showed that 75% of our cache pool was spent on expired page caches, and our cache horizon was only 5 hours. Moving the generational keys to a separate pool raised our cache horizon to two days, a 10x improvement. This will load very fast, even for millions of keys on a laptop; LOAD LOCAL INFILE is an optimized pipeline. This is comparable to the memcached stats slabs command, but lets you investigate things like expired ratio by slab, etc. Play around and see what else you can come up with. The only unfortunate thing about peep right now is that it blocks the memcached server. I could do an incremental version, but it would be quite slow. The current version is already CPU-intensive, taking 15 minutes to dump a 4GB memcached on modern hardware (turn off your client-facing processes if you run mixed front-ends!). A version in C would be much quicker, if someone is up for it, but for now the Ruby version is sufficient. I’d like to call out something important from my QCon slides: the Railsbench GC settings. In return, you get a minor increase in peak memory consumption. Not too shabby. Ruby’s GC is non-generational, which means that the GC looks at every object every time it runs. Java, OCaml, and other static languages have a generational GC, which means that only recent allocations are frequently checked (the older an object is, the less likely it is to be freeable). But Ruby pays a high cost each GC run because it looks at all old objects too; for example, the Rails code itself stored in the AST. Writing a generational GC is quite difficult, but there is one thing we can do: run the GC less frequently. This is what Stefan’s patches allow. If you install this patch from Sylvain Joyeux, you can add object allocation deltas to your Rails log, as well as use Stefan’s GC tracking methods. This gives you visibility into exactly when the GC runs and how much useful work it does. Spin up ab and script a representative page. Also start top in another shell to watch total memory in the Rails process. Now, do a simulated annealing-like search through the available environment settings. With the conservative Ruby defaults, the GC runs every other request, and takes 0.075 seconds, giving us a per-request GC cost of 0.038 seconds—40% of the entire request time. This is excessive. But if you explore a bit, you will quickly arrive at something like RUBY_HEAP_MIN_SLOTS=500000 RUBY_HEAP_SLOTS_INCREMENT=250000 RUBY_HEAP_SLOTS_GROWTH_FACTOR=1 RUBY_GC_MALLOC_LIMIT=50000000, which is what we use at Twitter. Woah! Now the GC runs only every 13 requests, at a slightly higher cost, for a per-request cost of 0.009 seconds. This translates to a general speedup of 34%. The frequency of GC calls corresponds quite directly to the change in RUBY_GC_MALLOC_LIMIT, but if we increase it much more the memory usage balloons. Optimizing Rails. Second-hand notes on on old presentation of Stefan’s. Acunote team blog. Has some good but scattered GC information. REE documentation. Phusion NL discusses Stefan’s patch. Brent Roman’s MBARI explanations. Detailed discussion of various leaks and optimizations. We are now experimenting with Brent’s MBARI branch of Ruby 1.8.6, kindly sponsored by EngineYard. So far it looks excellent, expecially in combination with Stefan’s patches. I will publish some results soon. My QCon presentation is available. interesting stuff and good questions from audience. architecture & tuning. Getting to learn from these experiences is priceless. oudenampsen: Was just by Evan Weaver of twitter. Gave the impression that any time he could commit suicide. However interesting. My presentation abilities have gone from “bad” to “tolerable”, so I’m relatively satisfied with the situation. Clearly I need to be more engaging. Here are some secret codes I am involved with. They are some of the best codes recently coded. A replacement for Starling, the distributed message queue. Written on the JVM (Scala) because of the mature garbage collector. Has a constant performance profile regardless of the size of the queue. A Rails object cache layer for ActiveRecord. It can do primary key lookups and single index queries solely out of cache. Especially nice if you have replication lag. A heap inspector for live memcached server instances. They said it couldn’t be done. Apache 2.2.10 got a new fair balancing algorithm. Smooths out latencies introduced by single-threaded backends with high standard deviation, such as Mongrel/Rails. Speaking of, I’m making sporadic progress on Mongrel 2, but don’t hold your breath. The main improvement will be Rack support. A downside of my position at Twitter is meager open-source progress. But hey, we’re hiring (must be in SF or willing to move). My RSI is slowly going away. The only real solution is to type less. And make sure to keep totally blasting your pecs.